It has been a long time since I wrote anything. I have a reason. I was robbed. Who stole from me you ask? Depression. It is a wicked thief that takes so much from you it is hard to recover from the loss. I am going to give some advice as to what helped on the darkest days. Over the past year I have studied positive psychology. It boils down to just being grateful. That's it. That's all there is to it. GRATITUDE. Even when I was fighting getting out of bed every morning, I sat there and decided what I was grateful for that day. Did it cure the depression? No. However, it did help just a little bit. On good days it put a smile on my face. 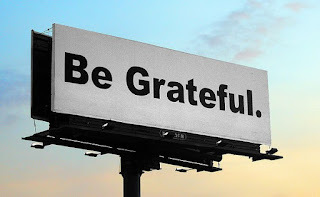 I strongly encourage everyone to develop a plan for daily gratitude reflection. I have switched jobs and firmly believe with this new job I will have more hours of free time. I was working a lot of hours a week for over a year (while in the midst of a severe depression and put my goals for getting people moving on hold. I kept moving, but I want to do more than that. I want to encourage others to keep moving. I cannot do that if I am not writing and sharing. Expect to see more #mustkeepmoving posts on Instagram, Facebook, and Twitter. If you don't see them...call me out! P.S. I am going to write more about the positive psychology folks I have been studying. I am rusty on my humor writing, so please be patient while I get back in the groove. P.P.S. "The black dog" is a phrase for depression.